DRIFIRE Military Army Flame Resistant Moisture Wicking Silk Weight Long Sleeve Shirt. Color Desert Sand. Sizes Large and XXL in stock. Every DRIFIRE garment offers inherent, permanent, no-melt, no-drip flame resistance and comfort. DRIFIRE garments use the same, patented moisture wicking technology used by the world’s best athletic brands. 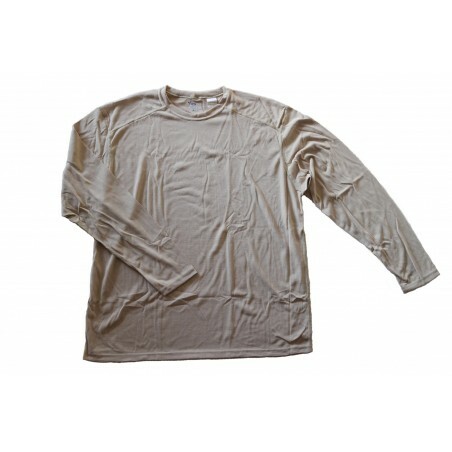 This allows garments to dry four times faster than cotton and help regulate skin temperature. Just like your favorite athletic shirts for the gym, DRIFIRE gives you high performance for the workplace with the ultimate combination of wicking and fast drying capabilities. DRIFIRE garments will not ignite or continue to burn once the source of flame is removed, a problem that can lead to increasingly serious burns with other types of garments. The flame resistant fiber used in DRIFIRE garments is self-extinguishing, ensuring that your exposure to flame or fire is minimized once you’re out of the danger zone. Designed for the US Military. Dropped seams for no-rub comfort. Dries four times faster then cotton. DRIFIRE size chart: Large (44") XXL (52") chest size. Material: 85% Modacrylic/15% Viscose. Made in USA. Style #DF2-105LS.